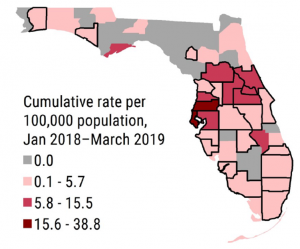 Florida health officials reported an additional 265 hepatitis A cases in March, bringing the total cases for the first quarter of the year to 690. The outbreak total is now 1239 since it started in 2018. Eight cases have died as a direct result of hepatitis A infection. Since January 1, 2018, 97% of cases have likely been acquired locally in Florida. In March, hepatitis A cases were reported from 25 counties. The central Florida region had the highest hepatitis A activity levels. 91 (34%) cases were co-infected with chronic hepatitis B or C. Co-infection with more than 1 type of viral hepatitis can lead to more severe liver disease and increase the risk of developing liver cancer. The best way to prevent hepatitis A infection is through vaccination. Since January 1, 2018, 97% of people with hepatitis A had never received a documented dose of hepatitis A vaccine. In March 2019, 96% of infected people had not received the vaccine.